Hope these pages can give you some hints, ideas or a fluid communication with our customer service. We provide professional and affordable handyman services in the three-county area including Miami Dade, Broward and Palm Beach Counties in South Florida. We are proud members of the Hamdyman Club of America and we mantain a close relationship with designers, retail stores, real estate agents, arquitects and constructions companies to help in your next project or just fix problems around the home and business. We have the experience, honesty and the best prices in town. We are also affiliated with the Weston Area Chamber of Commerce where you can ask for references. SOS Handyman can provide the service or can recommend you another company at no extra cost to you. We are the BEST service in town! FREE Kitchen sink with New GRANITE Countertops. GRANITE Countertops from $24 Sqft. all included - 9 types to choose From FREE ESTIMATES CALL NOW!! Phone Busy? Please leave a message and we will call you shortly! Get 10% OFF any job! 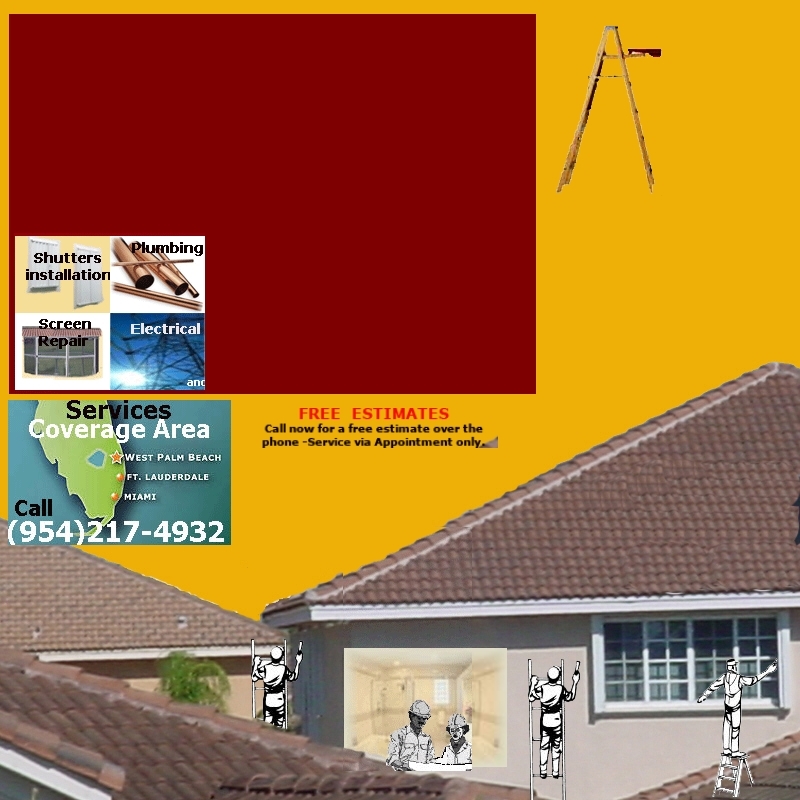 Call now and receive a 10 % off on any job performed in Broward county area (FL), no strings, no limitations. ONLY for New Customers, one discount per customer or address. Discount based on labor no materials if mentioned at time to schedule appointment. SOS Handyman is a subdivision of G&S International business corporation located in FL,33326 and servicing 33327, 33328, 33329, 33330,33331, 33332, 33325, 33324, 33323, 33322, 33321, 33320 and all Broward, Palm Beach and Miami dade county areas. reparaciones, handyman in 33327, 33326, 33327, 33331, recommended handyman, handyman matters, mr. handyman, MR. Handyman, handymen, FL handyman, handy person, flooring, painting, caulking, cleaning, tiling, house remodeling, house electrical, home reparations, home remodel, handyman in 33326, SOS Handymand of Florida, handyman services, broward handyman, weston handyman, Weston handyman, handy man, painting, carpentry, bathrooms, plumbing, caulking, screens, kitchens, home repairs, house repairs, home improvements, house improvements, home remodeling, house remodeling, Weston repairs, repairs in weston, discounts, broward county handyman, miami handyman, davie repairs, weston repairs, weston fence, fence repairs, screen repairs, screen patios, home cleaning, house cleaning, home inspections, house inspections, free estimates, wallpaper, pressure cleaning, electrical , removing fans, installinc fans, ceiling fans, picture hanging, garbage disposal, door repair, doors installation, closets installations, kitchen caulking, bathroom caulking, doors and windows, doors & windows, home maintenence, international home maintenance, carpentry, landscaping, home landscaping, garden maintenance, screen patio repair, plumbing, shelves, shelving, concrete/masonry, masonry, concrete, computer repair, network installation, drywall, plaster, garage doors installation, garage door openers, furniture assembly, shutters installation, shutters removal, pest control, selling a home, repair home after selling, inspection repairs, kitchen repairs, bathroom repairs, kitchen sink, alarms, home alarms, see your house from the internet, house watching, watch your home from the internet, wireless alarms, we are associated withSOS Handymand of Florida, handyman services, broward handyman, weston handyman, Weston handyman, handy man, painting, carpentry, bathrooms, plumbing, caulking, screens, kitchens, home repairs, house repairs, home improvements, house improvements, home remodeling, house remodeling, Weston repairs, repairs in weston, discounts, broward county handyman, miami handyman". Call our 954-217-4932 number, or email us with your project.